Offroad caravans have a certain ‘boofy’ air about them, perhaps to equip them for their purpose. Clues like the 150mm drawbar, raised chassis, checkerplate lower skirt and big wheels all suggest something off the beaten track. Indeed that is what Bruce MacDonald from Coastline Caravans at Hervey Bay, Qld, would like you to think. “We have these Roadstar Venturer vans built exclusively for us and we are certainly looking at the offroad market,” he told us. We did quiz him on the “offroad” term because it’s often bandied about loosely, but Bruce assured us he’s “not a pretender” and he meant “offroad”. Just as well then, since he calls his Venturer van the “Off Roader”. The basis of the SupaGal steel chassis consists of 6in x 2in rails in a double rail arrangement and they run back from the drawbar to behind the wheels, with a second frame above. The rest of the chassis is built up from that. For the tandem axles, three-tonne Simplicity independent suspension is fitted for the 16in wheels. Apart from the usual pipework and cabling, also under the van are the two 80L water tanks, which are gal sheet-protected and fitted between the rails in front of the axles. From normal viewing height, the Off Roader appears to have one spare wheel mounted on the rear bumper bar but it actually has two: the second is mounted on a rack underneath the rear of the van. At the business end of the chassis, a Hyland 3500kg hitch sits up the front and behind that is the usual handbrake and centre-mounted jockey wheel. Also on the drawbar sit two 9kg gas cylinders above a wire mesh rack. Above the chassis, the Off Roader body is built with a meranti timber frame that has full insulation and aluminium cladding, which is similar to a standard Roadstar. A strip of aluminium checkerplate protects the lower sides of the van and the front has checkerplate stone protection almost up to the front window. Tinted hopper windows are used all around and the door is the familiar Camec triple-locker. Other external fittings include an A&E awning and roof-mounted solar panel, air-conditioner and Winegard antenna. Inside the Off Roader, which has a rear entry, a front bedroom layout has been selected. The dinette and kitchen bench are on the nearside, although the bench also flows along the offside and across the rear. The bathroom is in the rear, offside corner. Generally speaking with this sort of layout, both the bedroom and dinette take up a fixed amount of space, so designers get the choice of a relatively large kitchen and a smaller bathroom or vice versa. It depends on what you prefer, but the design in this test vehicle assumes that the catering department is more important. Across the rear, the kitchen bench is fitted with a stainless steel sink with drainer and a small amount of benchtop space on either side. Storage space is more bountiful with four cupboards, one containing a small slide-out pantry and another two drawers. Above are four overhead lockers, two containing a second shelf. A powerpoint is fitted to the nearside wall and the bench is lit by a fluorescent lamp. Around the corner, the offside bench is a little busier with a Swift cooktop/grill/oven sitting alongside an under-bench microwave. That gives some bench space above, together with two floor lockers, a drawer for pots and pans and two overhead lockers. One of the latter is compartmented and contains the AM/FM radio/CD/DVD player. A single powerpoint sits behind the bench and above the cooktop, and a slim rangehood exhausts the cooking fumes. Between that and the bedroom sits the fridge, a Waeco 12V 190L item, with small lockers above and below. Filling most of the mid-nearside area is the L-shaped, macro-suede dinette. Contoured foam cushions offer a reasonably sized seating area for two and the table has rolled laminate edges and chamfered corners. Four overhead lockers sit above the seat but there are none of the usual under-locker reading lights. Instead, a ceiling-mounted fluorescent light is installed. Conveniently located at the door-end of the lockers are the switches for the lights and water pump, plus a gauge for the 12V system. In the front bedroom area, the queen-size innerspring mattress sits on a metal frame with a curved timber-slat bed base. There aren’t any bedside cabinets but behind the bed are the more useful bedside shelf and overhead lockers. The lower part of the offside wardrobe contains the water heater. Bedroom storage consists of a spacious under-bed area plus full-height shelved cupboards in the nearside corner and a half-height cupboard opposite. Above that is a wall mirror plus powerpoint and antenna connections for a bracket-mounted TV. The bathroom is kitted out with a bench-style Thetford cassette toilet, moulded-in washbasin (with flick-mixer tap) and a variable height shower head. The bathroom is compact but there is certainly room for the necessary. A fan hatch and a small sidewall window provide ventilation. 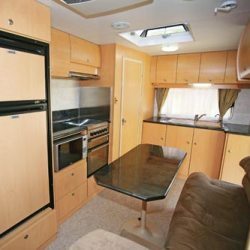 Being an offroad caravan, it comes with two 110Ah deep-cycle batteries plus a 40A Smartcharger and a 120W roof-mounted solar panel to keep the batteries up to speed. On the road, the Off Roader with a 2660kg ATM isn’t as heavy as some offroad vans we have come across, so a mid-range 4WD would probably be just fine for towing. Our LandCruiser was certainly up to the task. The only thing to keep in mind is that plenty of kilowatts are helpful when dragging an offroad van through the bush. At first glance the Venturer Off Roader looks a bit like a ‘conventional’ Roadstar but there have been several chassis modifications. 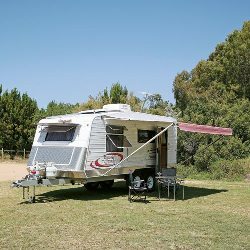 The people at Coastline have added their own touches inside as well, resulting in an offroad caravan that makes a trip to Hervey Bay all the more worthwhile.